I had thought about what leaving South Africa was going to be like early on in my trip. I figured I would leave the Rainbow Nation behind along with my email address to the couple of friends I had made on my journey. I figured I would return with some impressive new photos, a nice tan, maybe a wooden giraffe souvenir. However, as I sit here in my Colorado home, still in awe at how I could have forgotten how cold these snowy days can be, I realize that I had sorely underestimated what returning to America would be like. When I left Africa, I left a family behind. My African family didn’t look like most families I suppose: we were a beautiful mess of students and mentors, new best friends and generous neighbors, South Africans, Americans, Zimbabweans, and Ugandans. I left behind places I had danced, learned, cried, and realized for the first time that I was strong enough to live independently. And of course, as anyone who reflects on their point of view before and after this adventure, I must admit my perspective has changed: but not necessarily in the way I anticipated. I expected I would return home and be overcome with the need that is still so prevalent in modern Africa. And don’t get me wrong: there are moments when the thought of all I have compared to those I studied with and laughed with is enough to make my head spin. But more than that feeling of frustration, I hold a sense of admiration that I could relate so easily with people that initially seemed so different. It’s the beautiful truth in the fact that some of my new ‘sisters’ don’t look a thing like me, and some of my ‘brothers’ come from and incredibly different background, but in the end, we were all family. 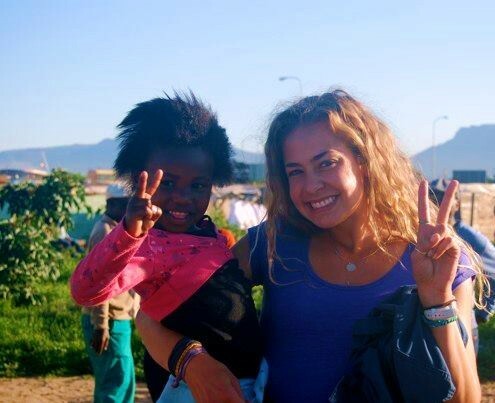 I came back from Africa with insight, but I left behind a little piece of my heart. I’ll be back one day, I know I will. Thank you, Interstudy. This program has shaped my life forever.